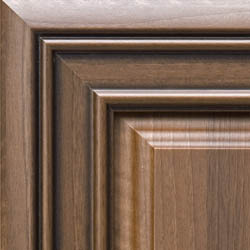 Our Expressions® product line offers the durability of 3D Laminates but the beauty of 5-Piece construction. Built similar to our 5-Piece wood doors, these 5-Piece 3D Laminate doors have the look of a real wood door but resist expansion and contraction with temperature fluctuation, clean easily, and don't require any additional finishing. Many styles are available with unique glazing applied to the frame and several raised panel options are available to create a truly custom look. For a sophisticated design reflecting the renowned artists who inspired this collection, Expressions® offers an opportunity to create a unique masterpiece...Bravo!